Feature: Will HoH Annabel Sacrifice Melvin? What goes around comes back around in the House of Diamonds. If you know what's good for you in this House, as Head of House during the Save and Replace it's best to put up a Housemate that has no chance of turning up as HoH in the following week. That's where the problem lies though, who would have though that Annabel would be the HoH right after her former House leader Melvin? It's anyone's game so anyone can be HoH at any time. Like actress Sandra Bullock once said, "I'm a true believer in karma. You get what you give, whether it's bad or good." After saving Bolt and putting Annabel in his stead, Melvin sits with an egg on his face this week as he will have to bow to the same Annabel and literally be at her mercy come her Save and Replace on Monday evening. If history is to repeat itself, Annabel will not hesitate to place Melvin's head on the chopping block just like Betty batted no eyelid when her turn came to Save and Replace. The Ethiopian Housemate would not lose a chance to revenge on the girl that had caused her misery just as she was settling into The Chase. Feza found herself shaking like a leaf during Week 2's Live Eviction show when Betty revealed the news to her and the rest of the Housemates. However, Feza didn't seem too surprised because she knew exactly what she had dished the Ethiopian lass in the previous week. The situation in the Ruby House has been the total opposite. Selly has been lucky enough to have Africa on her side in helping her get rid of the Housemates that she puts up for possible Eviction. Perhaps there's something in the water in the Ruby House that helps maintain the peace or could it just be sheer luck? The question remains; will Annabel return the favour and sacrifice Nigeria's boy Melvin or will she break the 'curse' and turn the game around? GBAMEST GBAM!!! We no be smelling! Naija for life babyyyyy!!!!!! Nijaaaaaaaaaaaaaaaaaa I trust una! No time!ghana dey ur side any day! we are ever ready 4 dat, we no dy shake @all. Melvin we r behind u 24/7 tru 91 days. We no be smelling.... 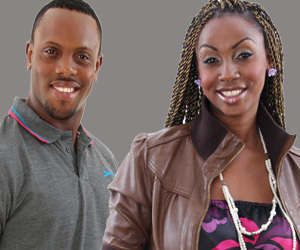 If una like, make una put Melvin and Beverly up for eviction, una suppose know say una nor reach!!! Naija for life babyyyyyyy!!!!! Melvin my guy, u saved by naija. B @ peace. Naija guys remember you only have one vote. let the chase begin cus melvin is not going any wayl. George thru, both wat about naija in diaspora? am not a naija guy both here in SA, I know how many of them stick to there country pals. we still prefer them to u Kenyans, cos when they support, they support. Niaja for life...Annabel just made a huge mistake!!! Votes were rigged as always, but Botswana was never there when SA needed them most. Now look???? God says vengance is mine. Tasha u keep nominating Angelo..now your friends are knifing you! This week is Karma week hehehehehe! Money belongs to riggers...u wanna bet hahaha! !